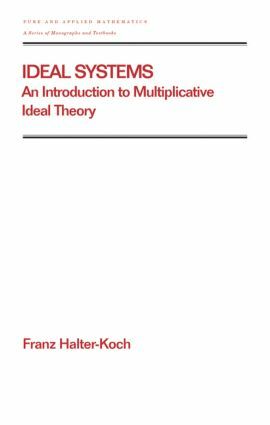 "Provides for the first time a concise introduction to general and multiplicative ideal theory, valid for commutative rings and monoids and presented in the language of ideal systems on (commutative) monoids." "…should become the standard reference for results on ideal systems and for star operations on integral domains." Part 1 General ideal theory: monoids and monoid homomorphisms; arithmetic of ideal systems; finitary and noetherian ideal systems; monoids of quotients; comparison and mappings of ideal systems; prime and primary ideals; quotients of primary ideals and primary decompositions; strictly noetherian ideal systems; the intersection theorem and the principal ideal theorem. Part 2 Multiplicative ideal theory: abstract elementary number theory; fractional divisorial ideals; invertible ideals and class groups; arithmetic of invertible and cancellative ideals; integrative closures; valuation monoids and primary monoids; ideal theory of valuation monoids; Prufer and Bezout monoids; essential homomorphisms, GCD-homomorphisms and valuations; Lorenzen monoids; quasi divisor theories; defining systems; Krull monoids and generalizations; (almost) Dedekind and Krull monoids; t-noetherian monoids; approximation theorems; divisorial defining systems and class groups; arithmetical properties of overmonoids; solutions of exercises; a guide to results on special integral domains.